How to Dry Herbs | Grow This! While many herbs can be harvested and used fresh throughout the growing season, it’s likely that you’ll get more fresh herbs than you can consume at any given time. Drying herbs is the most effective way to preserve them and get the most out of your herb garden. Here are some tips on how to dry herbs. Many herbs have the most potent flavor when harvested just before the plant begins to flower. Others can be harvested at any time and the taste will be consistent. A good rule of thumb is to never harvest more than one third of your herb plant at any given time. Try to harvest late in the morning, after the dew has been evaporated but before it gets too hot. This will make drying easier and also help to keep the herbs from wilting. The most traditional method for drying herbs is to hang dry them. This method is effective in most regions except for extremely humid environments. Try to clip the sprigs, stems or leaves of your herbs at an equal length. Bundle them together, usually 4-6 sprigs per bundle works best. Bind them at the bottom with a rubber band (or twine). Hang them in a warm, dry space with good ventilation. The porch works well in dry weather. For better protection, cover each herb bundle with a paper bag. This will help to keep dust off the herbs and collect any leaves as they fall off the stems. It will also keep sunlight from blanching the herbs. Be sure to slice ventilation holes down the side of the bags. If the herbs are not well ventilated, mold can set in quickly. After about two weeks, your herbs will be dry and ready to store. However, times will vary based on the thickness of your bundles and the dryness of the air. They should be brittle and crumble to the touch. Separate the leaves from the large, woody stems (discard the stems). Put them in a jar or another airtight container. Store them in a dark cupboard or drawer. For faster drying and in areas where the air is just too humid to hang dry, you can dry your herbs in the oven. Set the oven to the lowest temperature. Spread out your leaves (or chop your herbs into ¼ inch pieces) on a cookie sheet or oven pan. Use a piece of parchment paper underneath so as to avoid direct contact between the herbs and the metal. Place them in the oven on the top rack. They should take 2-4 hours to dry but check on them regularly as you don’t want to burn them. Different herbs will take more or less time to dry and a few can even dry in under an hour. Once brittle to the touch, separate the leaves from the stems, put in an airtight container and store in a dark cabinet or drawer. The stems should have lost all elasticity once fully dry. Food dehydrators also work well for drying herbs. They are fast and effective and eliminate the risk of mold. You can also use a dehumidifier for drying herbs. Spread them out evenly on a cooling tray in front of where the dehumidifier exudes its hot, dry air. Drying times may vary but they can dry in as little as two hours. You may need to turn or rotate them to ensure even drying. Wash your herbs thoroughly before drying. Be sure to soak up as much water with a paper towel as you can before placing them in the oven or hanging them out to dry. Try a salad spinner, which works great for ridding herbs of excess moisture. Discard any and all discolored, unhealthy or insect damaged leaves. If mold appears, throw out the whole batch and try again. 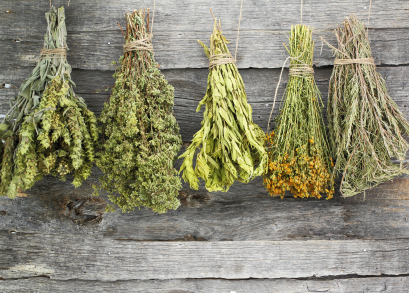 You may want to rotate your hanging herbs to help ensure even drying. The fewer sprigs you put in your bundles the faster they will dry and the smaller chance mold will set in. Do you have tips on how to dry herbs? Let us know in the comments section below.